I found a small, pink, raised bump on my dog's neck this morning. It is about the size of a pencil eraser. It does not have a head, and is the same color throughout, but I can feel that it extends below the skin a bit. She could not have had this lump/bump for more than a week or so because I check her frequently for skin bumps. She is behaving normally otherwise, but the location of the bump is concerning me. What should I do? I have pictures of it if you need to see what it looks like. I'd love to see a picture of it! Keep in mind that I can't officially give you a diagnosis over the internet. But I can give you an idea as to whether you should be worried or not. You can send a photo to photos@askavetquestion.com. Just sent the pictures, thank you! My first thought when looking at this is that it is likely a wart. If this is the case, there's not a lot that you can do about it. (Stuff like Compound-W doesn't work at all). If it is a wart she may get more of them. -If the color starts to look more red or "angry". -If it is growing really rapidly. If any of those things happen then have your vet see it right away. Otherwise you can likely wait until your next visit. 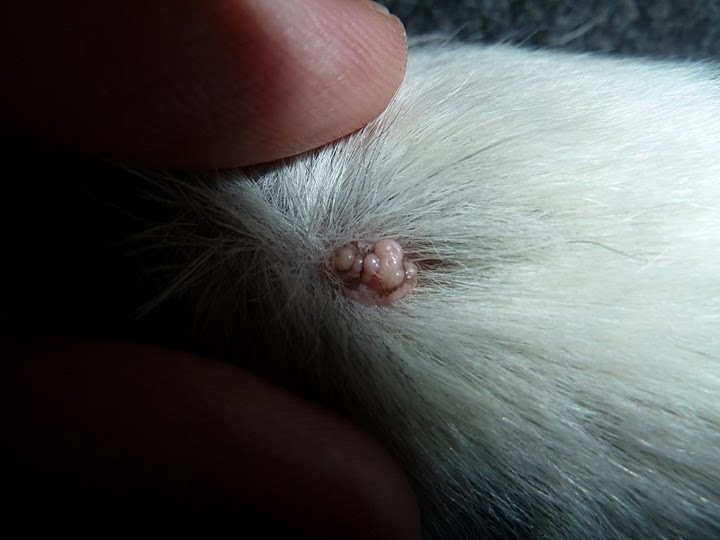 The main concern that I would have if it wasn't a wart would be that it could be a mast cell tumor. It really doesn't look like one from the pictures. But of course, there is only so much you can tell from pictures! So, this is a case where I would say to follow your gut instincts. If something is telling you this is not right then have your vet see it soon. Sorry for this question, but what does ulcerating mean? Ulcerating means that it is open and oozing. Thank you so much for your help--one quick follow-up question. It seems to have sprouted up rather quickly. I routinely check her for ticks and other skin anomalies and did not notice this bump. It's been about a week since I last checked her. Does the relative speed with which it has developed alarm me? I really appreciate your help! I wouldn't be worried at all about the speed in which it grew. It's really common for my clients to suddenly notice warts that they swear were not there a few days before. I checked her bump today and the color has faded from the light pink it was yesterday to more a whitish color. The size is about the same (if not, maybe, even a bit smaller). I just wanted to check in with you to see if this change makes any difference in how I should proceed. Thank you again so much for your time! Interesting. I'm really not sure how to advise you here. Turning from pink to white really shouldn't mean that there is anything serious going on. It's possible that it wasn't a wart but maybe a big welt from an insect sting?